Aime La Plagne is the highest of the La Plagne villages, and it has the best views of Mont Blanc and the surrounding Tarentaise Valley. The town connects to the Plagne Centre by two different blue runs, or a cable car for those not wishing to ski. Aime La Plagne offers piste side accommodation with epic views over the valley, surrounding mountains and on a bluebird day the Mont Blanc. Aime la Plagne is a sunny resort given its great elevation. The small town centre has a selection of shops, bars and restaurants- everything you could need during your holiday. Although all the satellite villages are well linked if you want to try out more of the restaurants La Plagne has to offer. The popular large Club Med in Aime La Plagne offers a fantastic base in Aime La Plagne. All Inclusive including food, drinks, ski pass and lessons and it has its own childcare facilities. The whole family will be entertained all week long at Club Med. 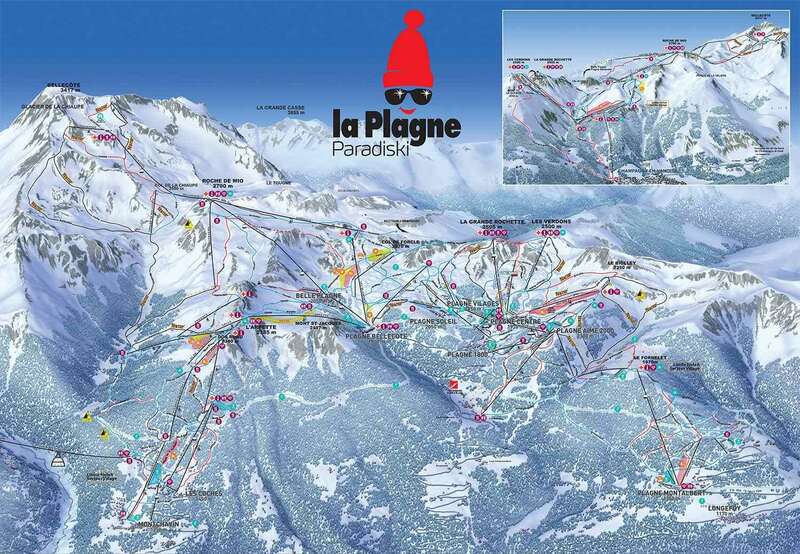 Aime La Plagne offers great links to La Plagne Centre, there is a cruisey blue run straight down. There are series of long blues and red runs which will lead you down to Montalbert. The village centre offers two great beginner ski areas and is a really hit with families. If you are looking for more thrill seeking pistes then hop on the Becoin lift which allows you to ski some black runs which drop off the back of the mountain. 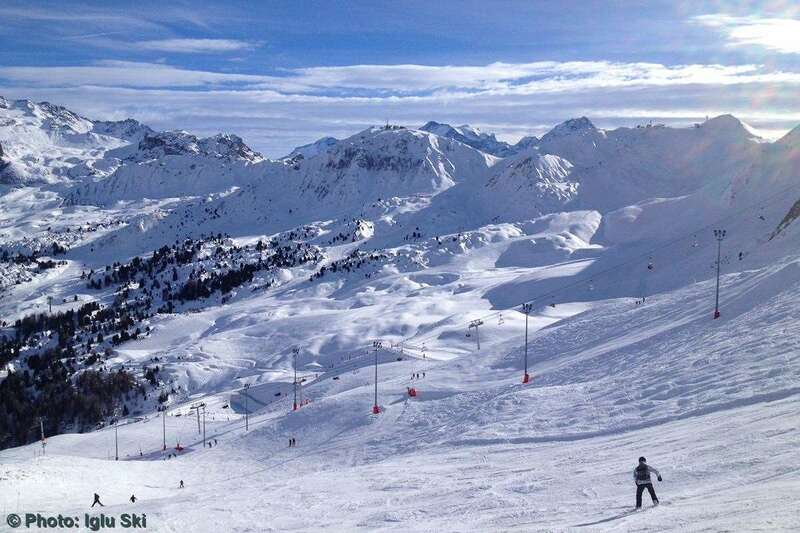 Aime La Plagne’s convenient links to the Plagne Centre is a definite attraction, as well as access to other resorts within the vast Paradiski area, which offers 425km of pistes across the three main resorts of La Plagne, Les Arcs and Peisey-Vallandry. The best park is found at Belle-Plagne, as well as a half-pipe. Experts will love the off-piste, while intermediates have the run of the area with the majority of runs being graded reds or blues. Meanwhile, Aime La Plagne has its own beginners’ area. La Plagne has an excellent history of snowfall due to its high altitude. Aime La Plagne sits at 2000m making it one of the highest villages in the La Plagne domain and one of the most snow-sure. The resort is dominated by the main apartment buildings, where you will also find a wide range of shops, bars and restaurants. There is also a wide range of bars and restaurants throughout the 10 La Plagne villages – the cable car to and from the Plagne Centre runs until midnight. Our ski experts recommend you pay a trip to L’Arlequin, one of the best restaurants in the area. Serving a typical menu of Savoyard specialities and pizzas- good hearty food to refuel for your next day on the slopes. Check out La Rhumerie if you are after something slightly more lively, a small venue however has a live DJ every evening and has a fantastic atmosphere. La Plagne is firmly on the radar for families as well as beginner and intermediate skiers. Masses of wide open piste are perfect for those finding their feet or building their skills. Experienced skiers shouldn't avoid the resort though, as with a little bit of exploring the off piste turns out to be fantastic. High altitude and a glacier guarantee early and late season skiing.